Sui Dynasty Rulers: 1) Wendi (581–604); 2) Yangdi (604–617); 3) Gongdi (617–618). Under the "Cultivated Emperor," Yang Jian, a former general who launched the dynasty, land reform was undertaken, Han institutions were resurrected, the imperial bureaucracy was strengthened and warlords and aristocrats were stripped of their wealth. The Sui dynasty fell apart in 618 after massive public works projects and three unsuccessful incursions into Korea overextended the empire's resources. The Grand Canal --- largest ancient artificial waterway in the world and an engineering marvel on the scale of the Great Wall of China --- was launched in the Sui Dynasty. Begun in A.D. 540 . and completed in A.D. 1327, it is 1,107 miles long and has largely been dug by hand by a work force described as a "million people with teaspoons." The world's longest modern canal, the Belomorsko-Baltiyskiy Canal in Russia, is 1,410 miles long. 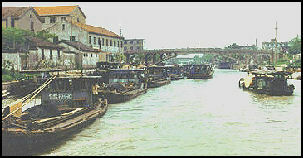 The Grand Canal today extends from Tianjin in the north to Hangzhou in the south. It connects Beijing and Xian in the north with Shanghai in the south, and links four great rivers—the Yellow, the Yangtze, Huai and Qiantang. Water levels are maintained using a system of stone gates which channel water in and out of the canals. When it is necessary to prevent flooding gates are opened so that water can be diverted into lakes. “The canal did more than move grain—as the country’s unifying feature, it was a potent political symbol and a strategic target for invaders. In the early 1840s, when the British wanted to put a stranglehold on China during the first Opium War, they occupied Zhenjiang, at the intersection of the canal and the Yangtze, throttling the flow of grain and tax revenues to Beijing. Within weeks China surrendered. The Grand Canal was created by connecting a series of smaller canals built in separate areas. It was constructed primarily to move troops from the north to south and transport food from the rich agricultural lands in the south to overpopulated cities and towns in the north. It was also built to allow merchants to avoid transporting their cargoes on the high seas where they were vulnerable to typhoons and pirates. Construction of the canal has been done in a piecemeal fashion over the centuries, with new sections added and others abandoned and rebuilt. The bulk of the work was done during the Sui dynasty under the leadership of the ruthless emperor Yang Di, who put 5.5 million workers to work during a six year period, ending to 610 A.D. No one knows how may died digging the canals but it was probably in the tens of the thousands. During the height of the Tang dynasty, which followed the Sui Dynasty, long strings of barges carried 100,000 tons of grain a year from the rice fields in the south to the north. The great Mongol leader Kublai Khan put three million people to work in 1279 to extend the Grand Canal 135 miles to north so that rice could be transported from the fertile Yangtze Delta, near Shanghai, to his new capital, present-day Beijing.